You are here: REDWOLF > Home > News >News Detail - New Systema PTW5-A4 P.T.W. We've got some sizzling hot news from Systema - a New Year brings us a new product, and it comes in the form of a new Professional Training Weapon. Systema have been busy, beavering away, to expand their line of P.T.W. guns by introducing an PTW5-A4 to their line-up and we are all looking forward to receiving this. The PTW5 will see limited world-wide production by early March. The fundamental concept of the Systema Professional Training Weapon remains the same, creating a platform that is the premier training tool of choice. The Systema P.T.W. has always been a reliable training weapon, although that hasn't stopped them focusing on creating a product with an even higher level of durability and robustness with their new PTW5-A4. This emphasis starts from what you see on the outside, such as the outside receiver and to what is found within, with even stronger internals and revised electronic control unit. One of the reasons that P.T.W.s make excellent training weapons is that they are modeled as close as possible to the real steel equivalent, thus the dimensions are exactly the same as the real one. It may seem trivial, but this attention to detail is why their Professional Training Weapons are used by Law Enforcements around the World for training purposes. Systema have carried on this tradition with the PTW5-A4 P.T.W. and Systema state that "in Close Quarter Training it leaves the operator with the most realistic feel as can be experienced". This PTW5 weighs in at a hefty 4Kg, which gives you the same feeling as the real gun. 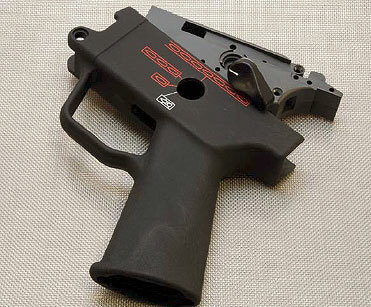 With a one-piece receiver, Systema were able to realize an unimaginable level of strength and durability in the body. The larger components require for a stricter management of the dimensions, although Systema achieved this with a die cutting technology, coupled with a stable plank casting. 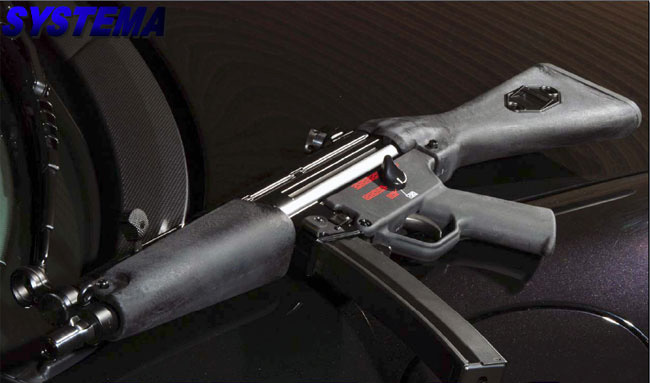 Systema were able to create a body that can handle rough treatment for an extended period of time that will assure the user knowing that it will be able to handle the abuse one is willing to throw at it. Another appeal of having a one-piece receiver that has the same dimensions as the real steel is that real steel scope mounts can been installed without any modifications.For this PTW5-A4, Systema have adopted a Nylon material that is 50% glass fiber, with a high heat resistance. Users of the real steel will feel right at home once they get their grips on this Systema P.T.W., as the grip frame has the exact same specs as on the real one; what's more, the selector lever and its movement accurately replicates that of the real one therefore giving an unparalleled level of realism. Each side of the ambidextrous safety lever features independent gears for an accurate feel. The CPU control unit and selector switch found in this new PTW5-A4 has a unique characteristic in that it takes the form of an L-shape. The control unit is adopted from the previous gearbox system, although has improved performance, able to endure a higher temperature generated thus making it even more reliable than before. The computer also allows the PTW5 to operate in semi auto, 3-burst auto and full auto modes. Note that this is the first one on the airsoft market with 3-burst mode! By adopting the previous M16 series main spring, cylinder head assembly as well as the spring guide assembly, it helps to make it easy to maintain. Their tried and tested Spur Gear structure has been used and is key in providing the reliable performance that this P.T.W. provides. Fine adjustments were made to each gear axle and the increased precision of the gear case production (as well as the dimensions of the one-piece receiver) to allow for a shorter nozzle mechanism. The motor utilizes a steel magnet case and an exclusive PTW5-specific 480 type motor. The PTW5-A4 will come standard with the M90 Spring Cylinder Unit. Like the previous M16 series, this PTW5 maintains an interval dimension, between the outer and inner barrel of only ±0.05mm; the outer barrel is produced using Systema's method of metal shaving. The inner barrel incorporates an internal diameter of 6.04mm. Systema recommend using a 9.6v 2400mAh battery, the stock is plenty of room to store a large battery and the maximum sized battery that can be used is a 12v 2400mAh battery. This Systema PTW5-A4 is due for release in early March and is expected to cost $995US. Challenge kits will be out soon after too, with two versions expected - one for beginners and one for experts. The beginners version will have the more complex parts already finished so that assembly will be an easier task. Prices for the Challenge kits are expected to be $880US. A MAX version is also on the cards, although there isn't a date set yet. Performance figures for the MAX are expected to be 150m/s.